The largest employer in Jacksonville NC is the defense department with Camp Lejeune and the Marine Corps Air Station New River located nearby. Given the large number of military families, it is no wonder that moving companies will be on your list to contact at a moment’s notice. And in Jacksonville, there is a new moving company that is making an impact. 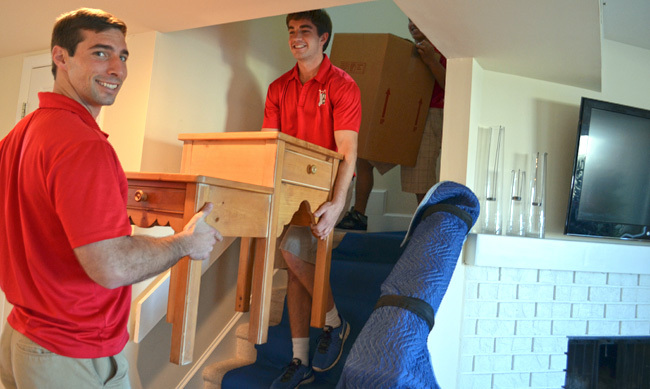 Few Moves Moving Company is the premiere moving company in the Jacksonville area. And as our presence increases, more and more civilian families are also taking advantage of our services. It is a fact of life that in the military, families have to be ready to pack up and move at a moment’s notice. And with the increased military activities around the world, never has that sentiment been more true than today. Fortunately, for the military families in Jacksonville, you have a secret weapon. Few Moves Moving Company is the moving choice for you. We can be ready to move quickly and professionally and move you anywhere you are transferred within the Continental United States. We understand that often a military spouse is either not on base or is too busy to actively participate in the move. And with children, finding new living quarters, and getting everything organized to move, can be a bit overwhelming. But Few Moves can take much of the stress off your shoulders. Just one call brings us out to let you know what services we provided to you and to give you a comprehensive estimate of what your move will cost. While we have competitive pricing, our customer service and expertise in the field is surpassed by no other Jacksonville NC moving company. Jacksonville NC is the fifth fastest growing city in America, and Few Moves is here to help you with your transition to the area. The Outer Banks and the beautiful East Coast of NC is an amazing draw. If you have temporary housing while finding that right home in the area, give us a call today and let us show you how effective our moves are compared with other movers moving companies. We offer complete services if you require or just a helping hand if that’s what the job calls for. We are a full service mover, fully licensed and insured. We can pack, load, and transport your possessions. We can also go to a temporary storage facility and transport your belongings to your new home. We are a company whose employees are full time, fully trained in the moving business. We don’t have “hired hands” to assist us. We have experienced teams of clean-cut, professional movers who understand that relocating your family can be a hectic and stressful time. And part of our mission is to remove that stress and provide you with a pleasant, efficient, and professional moving service. We have all the supplies you’ll need to pack your belongings including cardboard boxes, tape and materials for padding. Our trucks are top of the line to make sure that your possessions are safe and secure during transit. We always use runners to protect flooring from scuffs and scratches as well as protecting railings and doors from scratches and dents. But the most important tools we have is our movers themselves. Our professional full time employees aren’t just college kids looking for a few bucks or a “hired hand” with absolutely no experience or sense of responsibility. So when your family is ready to move, even at a moment’s notice, give Few Moves a call. Our job is to make your move stress free so you can focus on more important things. We are better than the rest, and we are quickly becoming the moving company of choice in Jacksonville, NC.